Have you ever heard of chia seeds before? No, not chia pets although that is the same type of flowery plant that produces the chia seeds. Chia seeds are native to Mexico and Guatemala and have been around for centuries. They have recently become popular in America and are considered a “superfood,” rich in omega-3 fatty acids, fiber, calcium, antioxidants, and protein. 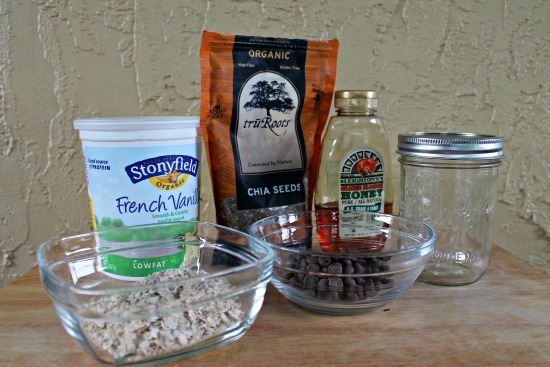 If you’ve been on Pinterest lately I’m sure you’ve seen chia seeds featured in many different recipes. 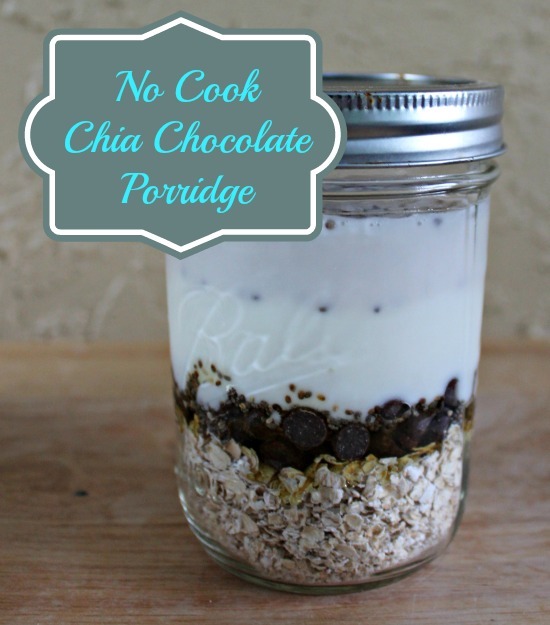 My “No Cook Chia Chocolate Porridge Recipe” was based off one of those pins I found months ago and have since lost (or I would gladly credit my influencer). The original recipe had fruit and nuts but I need a little chocolate kick to get me started in the morning so I tweaked it. 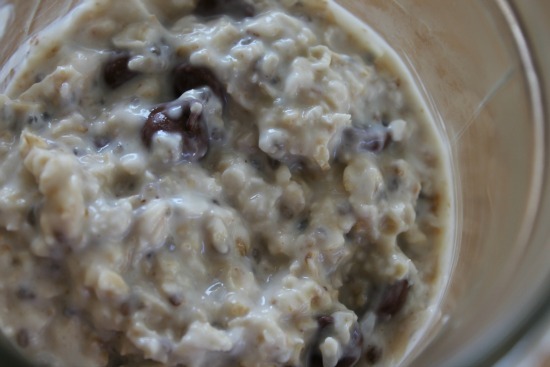 I rarely measure any ingredients, if you like a thick porridge add more oats or if you like a thinner porridge add more milk. There really isn’t too much you can do to this recipe that would mess it up. A simple to make, no mess, make-ahead breakfast. You could mix up this recipe with your own toppings; fruits, nuts, etc. Start with a clean glass jar and begin to layer the ingredients. Close the jar with a secure lid and shake until mixed. Store in fridge 3 hours or overnight. When you get ready to serve this just give it a quick stir to make sure you get all of the ingredients in your first bite. The chocolate chips stay firm and crunchy while everything else is soft. I like to eat it straight out of my storage container and it is usually enough for 2-3 servings because it’s very filling. Enjoy! How do you use your chia seeds? What tasty ingredients would you use to make this recipe your own? Disclosure: Some of the ingredients in this recipe were provided to me free of charge either as a coupon or part of a promotion. I am a Stonyfield YoGetter and receive coupons for free products throughout the year. This looks delicious! I made a chia pudding overnight last night and had it this morning and liked it. It took me a few bites to get used to the consistency, but this looks like it has some great stuff in it to help with that! The good thing with adding the chia seeds like this is that the consistency isn’t changed much. I’ve tried it the other way and it does take a bit of getting used to. Enjoy. This looks delicious! Now if only I could remember to make overnight breakfASTS! Kat recently posted..Collagen love for all! I try to remember to make it as I’m putting away leftovers from dinner but that doesn’t always happen. This sounds great! I’ve never used chia seeds but I love chocolate and banana porridge. Oats, almond milk, cocoa powder and a sliced banana. I usually cook it but your way looks like it would work for this too! Thanks Kerry. What I loved most was that I didn’t have to cook which for a busy mom is my key to success. Enjoy! This will be a HUGE hit in my house! Totally pinning this!